Who is excited for premier of the 5th season of Walking Dead? 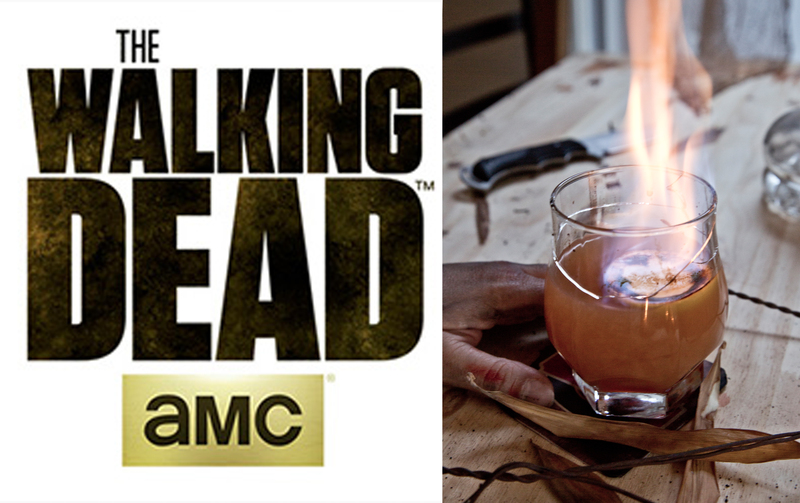 Tomorrow (October 12th) is the premier of the 5th season of Walking Dead on AMC and to commemorate it, this week’s post is a recipe for a cocktail to drink while watching what I’m sure will be a very violent and stressful first episode of the season. It is VERY strong so it will help calm your nerves. The Carl cocktail is a play on “The Zombie” cocktail, which I had the great pleasure of ‘testing’ yesterday. The drink was created in the 1930s, so I was surprised that it would be called “The Zombie”, as I didn’t think zombies were all the rage 80 years ago, but after seeing how much rum and brandy went into this drink the name made so much sense. 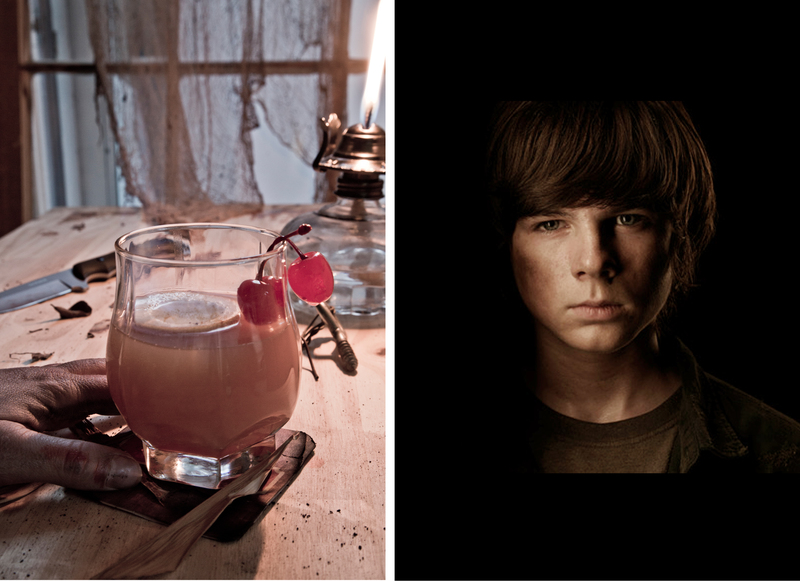 Since season 4 of the Walking Dead was the first season that I wasn’t actively rooting for Carl to be zombified I figured I’d name the cocktail after him. The recipe was created by the always talented chef and food stylist Victoria Cox. Enjoy the recipe, but be warned this is a strong cocktail, so don’t drink it too early in the episode or you’re likely to forget what is going on. The traditional Zombie Cocktail is also called the Skull Crusher if that gives you any idea what you are in for. Combine first 6 ingredients in a cocktail shaker. Add ice; cover and shake 15 seconds. Pour into an ice-filled glass. Garnish as desired. *this is cool and would be cool with your brain ice cube. Cut a lemon in quarters. 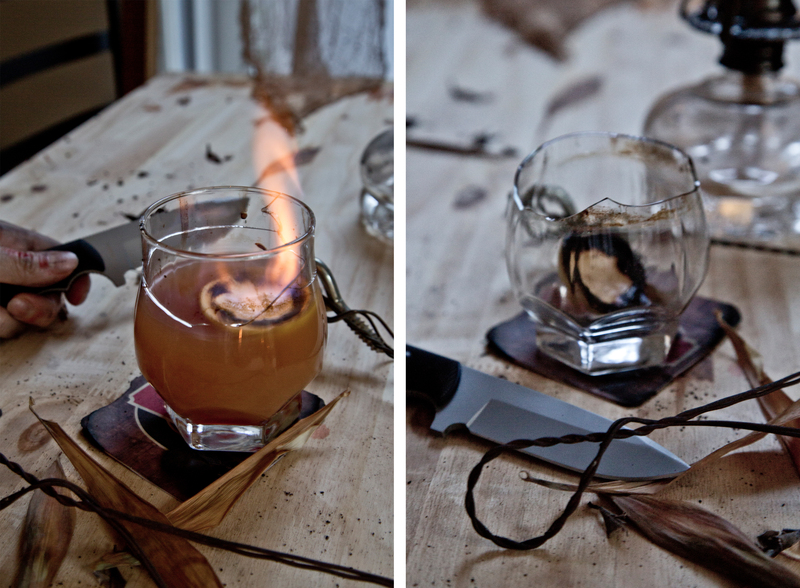 Hollow out one quarter (scrape out flesh) to create a “boat.” Float on top of drink. Pour ½ oz (or small amount) of high proof rum into lemon boat. 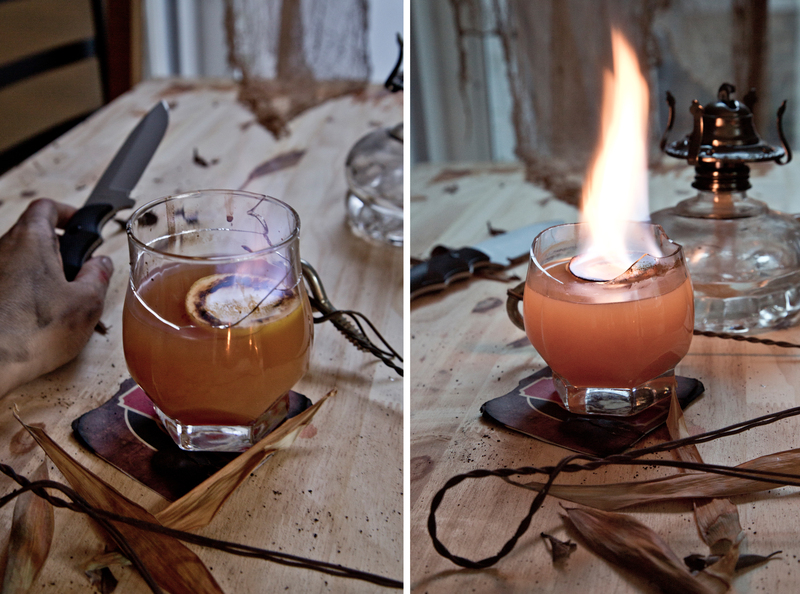 With a long handled match or lighter- be careful- ignite the rum in the lemon boat atop your cocktail. WARNING: Do I really need to do a warning about playing with fire and alcohol? Don’t be a moron when you are combining fire and flammable substances. I had a fire extinguisher handy during this shoot, just in case things went terribly wrong. Also notice that the glass is cracked in the photographs, that was not intended. It took quite a while to get my shot right so the flame was lit far too long (15 minutes) and it cracked the glass. Don’t let your glass get too hot. Also: AMC-I borrowed some of your photos from your website, which as a photographer I never do, but it seemed fitting with the premier and all, but I can remove anything if that is a problem. 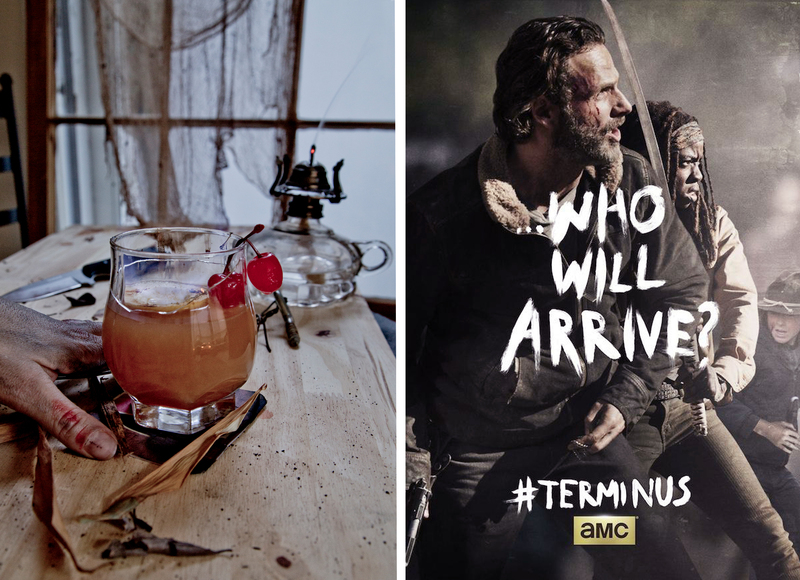 Categories: Recipe | Tags: amc, blood orange juice, brandy, cocktail, fire cocktail, flames, lemon juice, pineapple juice, rum, season 5, the carl cocktail, the skull crusher, the zombie, walking dead | Permalink. Oh yum! We can’t wait for The season premier! Thanks!! Did the premier live up to your expectations? !